Caldwell are able to manufacture and supply integrated restrictors for friction hinges, making for greater convenience and more discrete aesthetics. 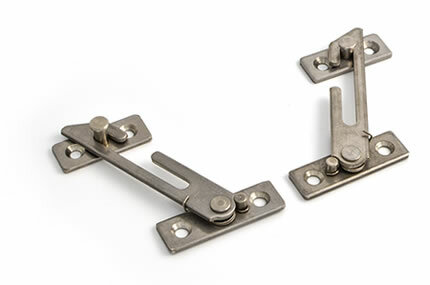 Integrated restrictors are an alternative to installing a friction hinge and retrofitting a restrictor post-installation, making for a more straightforward installation process. Constructed from stainless steel with brass shoes, integrated restrictors can be installed in either releasable (released via key) or non-releasable variants. For customised installation, they can be positioned on adjustable “T” tracks to ensure that they are suitable for installation in a wide variety of window configurations. Caldwell are also able to supply integrated restrictors which are releasable, but by the means of a readily available non-specific tool such as a coin. Available in heavy duty options, they are constructed from a limit arm connected to a mounting bracket and detachable clip to an adjustable track. They are also made steel for durability and strength. This type of integrated restrictor is particularly useful for fully releasing the window to facilitate maintenance and cleaning. Integrated restrictors are able to extend up to a maximum of 50° when fully open, and depending on the model, non-releasable and releasable restrictors are available with ”A” arm lengths between approximately 150mm – 300mm and “T” track lengths between 150mm – 450mm. For more information on our integrated restrictors, don’t hesitate to contact us, or consult our installation and product information literature.